How you present your emails is going to be what makes or breaks you in the world of email marketing. The more engaging your emails read and feel, the more likely you are to delight your leads and keep them coming back for more. Your email subject line is what drives open rates, so this is one of the most important aspects of good email design. Feel free to play around with your subject lines a bit. You can be playful, humorous, mysterious, and intriguing. But make sure your subject line is clear and concise. The worst mistake an email marketer can make is to send out a subject line he thinks is clever, but is lost on everyone who opens it. So be creative, but also be clear. Ask a question: Create a subject line that includes a question. This type of subject line often compels your readers to open the email. It also forces your reader to pause and consider the answer to this question. Make a list: People love lists in blogs and content pieces, so why not try a list subject line in your emails? Top 3, 5 tips, and so on do wonders for your open rates. Offer a discount: Start your subject line with 5% off, or Free Sample, and you have someone’s attention instantly. After you have your lead’s attention, you have to keep that attention at least long enough for him to read your email and take an action. A good best practice is to make sure your copy is human. Have a little fun and don’t be afraid to bring in some humor. You also want to educate and not sell. Show your leads why they should read your email and click through. No one wants to be bothered with an ad in the form of an email. Take into consideration what function you intend your email to have. Is it promotional or relationship-building? The answer drives your copy and tone. Just like any website or landing page, your copy should be clear and concise, address the pain point, and include bullets or lists for easy scanning. Don’t forget to proofread! Spelling and grammar mistakes are a huge no-no. Take a look at the following figure for an example of clear, concise copy. 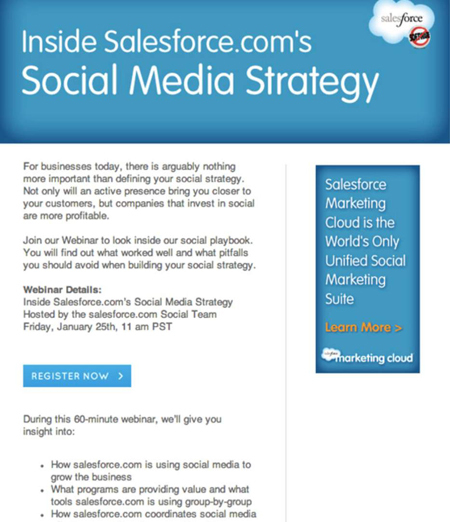 Note that Salesforce includes a couple of short paragraphs, followed by a clear call-to-action (CTA), and then a few bullet points on what you will learn by signing up for their webinar.